I felt like I knew turn of the century New York going into this book – I’ve been studying it since I was a kid. In middle school we learned about the Tammany political machine and yellow journalism. In college I learned how the Triangle fire led to changes in the fire code, and that exit doors should always open out instead of in. A couple of years ago I read A Tree Grows in Brooklyn and gained a ground-level appreciation of the time. It turns out that was only the barest of frameworks. Triangle shores up the weak bits, fills in the gaps, and extends the lessons of the fire into the New Deal and beyond. And it was a wonderful read to boot. Big social and political movements such as garment worker strikes and pushes for political reform are masterfully illustrated using details from the lives of real people that were affected by them. The fire itself is a big part of the book, of course, and the harrowing minutes are covered in detail and from many different angles. 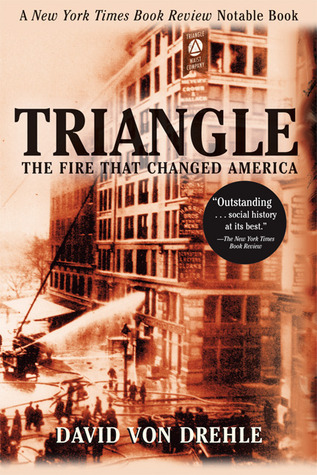 I was scared the post-fire narrative would wane but the drama of the Triangle owners’ trial was the most riveting part of the entire story. Von Drehle’s research is exhaustive and impressive, with notes and appendices taking up nearly a third of the pages. He also complied a complete list of victims, an impressive feat as no one had bothered to give it a try in the 90 years following the fire. (!) All in all it’s a wonderful piece of non-fiction that made me vow never to forget March 25, 1911. 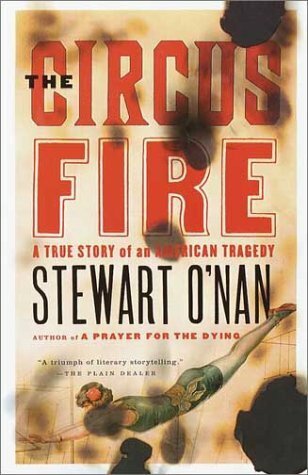 I finished this book not long after reading The Circus Fire: A True Story of an American Tragedy and they make an interesting compare and contrast study. They are both about historical fires that killed roughly 150 people but differ in every other respect. Part of it has to do with the subject matter. The circus fire was due to a single company not following the law, forgoing fireproofing and dipping the big top in paraffin and white gasoline to waterproof it instead. (Smart.) The Triangle factory, on the other hand, passed inspection – the problem was with a lack of regulations in the first place. So while Triangle covers large-scale impact decades down the line Circus barely moves from the scene of the crime. The authors themselves compound the differences. Triangle is a non-fiction book by a non-fiction writer, lovingly and painstakingly filled with end notes and references. Circus is a non-fiction book by a fiction writer, crafted for story while remaining true to known facts. There may be more creative non-fiction stuff going on but it produces chapters that I was unable to put down midway. When I finished The Circus Fire I thought, that was awful. I’m glad I wasn’t there. When I finished Triangle I thought, that was awful… but a bunch of amazing people were able to parley it into a greater good. Circus is about finding closure. Triangle is about making progress. Outlaw. Preacher. Night Hawk. He’s had many names, but he can’t escape the past. Since Ian Vance’s beloved wife was murdered years ago, the hardened bounty hunter knows he’ll never feel love or tenderness again, so he’s made it his mission to ensure others get their justice. But when he’s charged with delivering a sharp-eyed beauty to the law, Ian can’t help but feel he may still have something left to lose. Orphaned at twelve, Maggie Freeman has always found her way out of trouble. But now there’s a vigilante mob at her back who would like nothing more than to see her hang for a crime she didn’t commit. Maggie may have to accept help for the first time in her life . . . even if it’s from the one man standing between her and freedom. As the past closes in, the sassy prisoner and toughened lawman may just find a passion between them that could bring blinding happiness . . . if they’ll let it. If you’re looking for romantic suspense with a single story arc including a big bad, this isn’t it. Night Hawk is more of a collection of adventures involving the hero, heroine, and a whole cast of shady characters. This is unapologetically a western – there are saloons and people getting thrown off of moving trains and warning shots and vigilante justice (sorta). This isn’t a place and period I read in very much and the world is plain ol’ fun. The secondary characters are given their due and felt like people despite their limited time on the page. Charlie is a hoot, especially. I learned a lot and am excited to read more novels set in the era. Maggie is a little too perfect. I don’t think she had a single flaw other than speaking her mind, which never turned out badly for her. Her bag also seemed to have just what she needed, when she needed it. The conflict comes in spurts, and sometimes there’s a chapter that has no conflict at all, just people moving from place to place. I read this book digitally and I had to keep checking the percentage left because it felt like there were three happily ever afters in there. The history is fascinating, but in a couple of passages Jenkins starts listing tons of dates and… I could care less about dates. It also made me wonder how the character was able to pull all these dates out of their head so easily. A fun book that’s great for spending some time in the Wild West, but maybe not the most gripping or immersive read. Halfway through a midsummer afternoon performance, Ringling Brothers Barnum and Bailey Circus’s big top caught fire. The tent had been waterproofed with a mixture of paraffin and gasoline; in seconds it was burning out of control, and more than 8,000 people were trapped inside. Drawing on interviews with hundreds of survivors, O’Nan skillfully re-creates the horrific events and illuminates the psychological oddities of human behavior under stress: the mad scramble for the exits; the hero who tossed dozens of children to safety before being trampled to death. Brilliantly constructed and exceptionally moving, The Circus Fire is history at its most compelling. I’ve heard about the circus fire before, but always in passing – somewhere in the Northeast a big top burned mumblemumble so sad mumblemumble. Thanks to O’Nan we have the full story. The first two-thirds of the book is harrowing, gripping reading. The narrative is pieced together artfully and while a lot of names are thrown around I didn’t feel pressured to keep them perfectly straight. A fire is not a pretty way to die, and the effects of the heat and flames are not sugarcoated. As someone medically-adjacent I found the way they treated burns in the 1940s interesting while being thankful we know not to do a lot of that stuff today. The last third drags a bit, detailing money problems at the circus, prolonged recoveries, and the wild goose chase of a possible culprit. Things pull together by the last chapter though, with the case of Little Miss 1565 just as powerful today as it was seventy years ago. Several survivors said the one thing they will never forget about the circus fire as long as they live is the sound of the animals as they burned alive. But there were no animals. A great read for anyone interested in disasters and what can be learned from them.